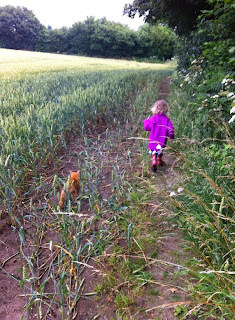 Musings for the potting shed...: Thriving weeds or flourishing seeds? Thriving weeds or flourishing seeds? Or "Everything I needed to know about life I learned on the allotment" (in homage to Robert Fulghum's kindergarten passage). This week I'm thinking about "thriving", a word we maybe apply more to gardening or horticultural situations, as it implies flourishing growth. To me this immediately makes me think about the thriving weeds that we wage incessant war against on our allotment. If you're not from the UK you may not be familiar with the peculiar things we have called allotments. 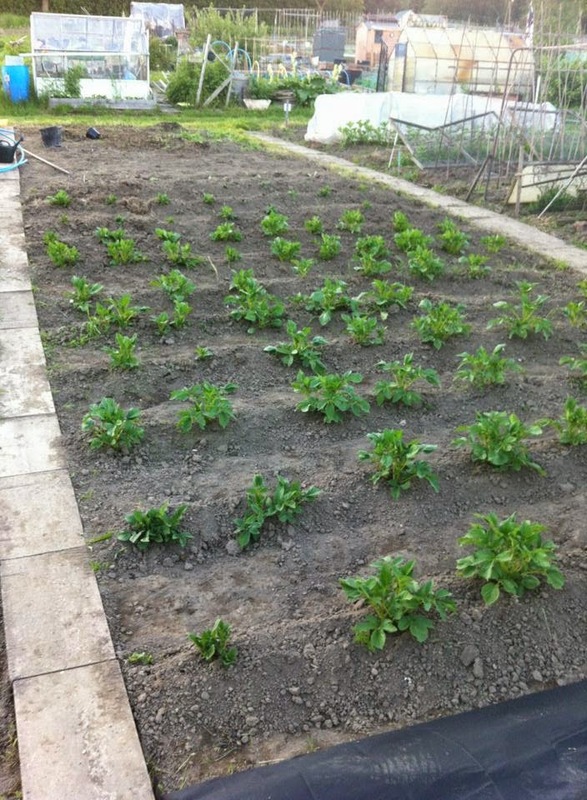 Napoleon may have called us Brits a nation of shopkeepers, but in many ways we're a nation of gardeners, and allotments are really just community gardens where you can rent a plot of land to cultivate your own crops. They're a national institution, enshrined in various arcane laws and bylaws and have been around for hundreds of years. Our allotment site is at the end of our road, about 50m from our front door, and our plot (number 39) is about 15m long and 9m wide (or about 50ft by 30ft). It's a big plot (one of the biggest on the site) and as much as growing anything, the main challenge is keeping the weeds down - they thrive with much less care and attention than anything we intentionally plant! 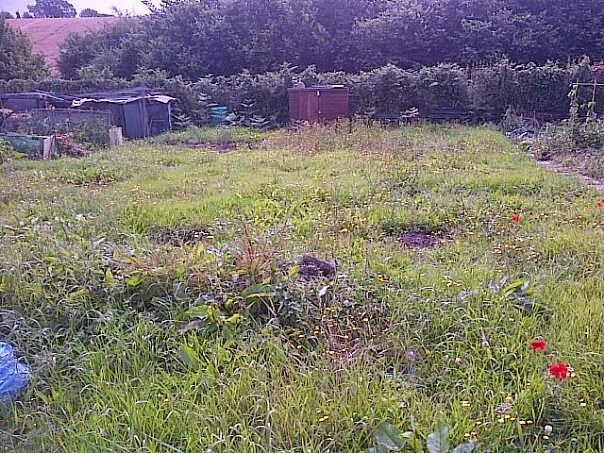 "It feels like we only have to turn our backs on our plot for a week in the spring and the weeds are waist high"
It feels like we only have to turn our backs on our plot for a week in the spring and the weeds are waist high.. especially as so many fellow plot holders are retired and therefore keep immaculate "show" plots. However, something I have learned is that it generally looks a lot worse than it really is. Weeds have a habit of spreading themselves out, taking up as much room as possible, but often they're only anchored to the ground in one place. This is an allotment lesson we can apply to our daily life, as our situations often feel worse than they really are, crowding our thoughts, when actually decisive action to the root can easily rid us of the stress they bring. We need to be good mind-gardeners, as I talked about in this post not so long ago. One thing that having an allotment has taught me over the years is about the time it actually takes things to grow - it's a long lesson in patience, and in gentle consolidation. However impatient I have been about various crops growing, you just can't rush them! They grow in their own time. It's the same with us - we can get so impatient (well, I can anyway) when things don't happen in the way we want them to and with the speed we want them to. But I'm sure that so many of us can look back on situations that seemed endless at the time, but in hindsight timing was perfect and things actually worked out better as a result. Many things in life are better for maturing longer - wine, cheese, even brewing a pot of coffee! Patience is an undervalued commodity in our "instant"culture. Consolidation is also important. 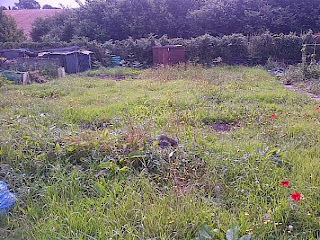 When we got our allotment it had been fallow for some time, the entire plot was waist high, and to even think about planting anything, let alone reaping anything was some way off. It's easy to be daunted by our circumstances, but as Saint Francis of Assisi said: "Start by doing what's necessary; then do what's possible; and suddenly you are doing the impossible." "Many things in life are better for maturing longer - wine, cheese, even brewing a pot of coffee!" It felt the same on our allotment, the need to clear it and conquer it slowly, and it can be the same with our dreams and the promises we feel God has given us in our lives. I'm not saying that we can't accomplish big dramatic things - I do think there are times for big decisions and big action - but I firmly believe that many things are accomplished little by little. Steadily sowing, feeding, weeding and cultivating. For me this is not just physical weeds on our allotment (and I do take great pleasure in digging and hoeing the soil), but also our ideas and dreams. Much of the stuff that starts to grow on our allotment is unintentional - whether perennial weeds or dandelion seeds blown in by the wind. I once watched a documentary about weeds (yes, I know how to party), which simply defined them as a plant in the wrong place. Maybe we've got a lot of unintentional things in our lives, good or bad, weeds or not. What are we allowing to thrive in us? The trick is to spot the weeds early and pull them out before they root too deeply. Maybe we need to consolidate some of the things we have intentionally planted and weed out the things that are crowding out the space our seeds and saplings need. "I firmly believe that many things are accomplished little by little"
Change in our lives doesn't necessarily happen overnight (although it can), much the same way that I can't magically get rid of all the weeds on our allotment (napalm isn't really an option). We need to give ourselves time to grow, to mature, even to grieve. As well as cultivating our ideas, dreams and God-promises, there's also a time and a place for cultivating our circumstances to enable us to thrive where we are.. and more than that, to move in the direction we need to go in (like the heliotropic movement of plants following the sun). A book I'd recommend to help you with this is "Now discover your strengths" by Marcus Buckingham and Donald Clifton. Like many others, I have found this really helpful in discovering the things that I naturally flourish in, things I can cultivate to make me thrive. It's helped me articulate the things I love doing, and helped me make decisions at both work and home to cultivate my strengths. For instance as well as writing this blog, I'm also finding more opportunities to write for my employer. The more we play to our strengths, the more I believe we'll thrive - but we still need to keep those weeds down! Thanks for taking the time to read Thriving Weeds or Flourishing Seeds. If you've enjoyed it please share it with your friends on social media. Why not subscribe to The Potting Shed Podcast on iTunes for the audio version and much more (direct RSS feed is here). Happiness isn't all it's cracked up to be? The only thing to fear is fear itself? I ask not for a lighter load..